Columbia University Press, 9780231136525, 343pp. Whether you're digging into a slice of cherry cheesecake, burning your tongue on a piece of fiery Jamaican jerk chicken, or slurping the broth from a juicy soup dumpling, eating in New York City is a culinary adventure unlike any other in the world. 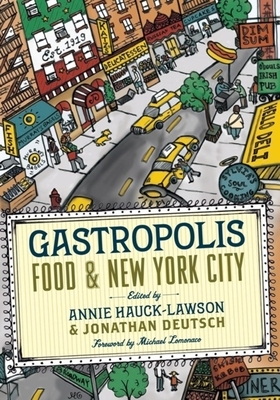 An irresistible sampling of the city's rich food heritage, Gastropolis explores the personal and historical relationship between New Yorkers and food. Beginning with the origins of cuisine combinations, such as Mt. Olympus bagels and Puerto Rican lasagna, the book describes the nature of food and drink before the arrival of Europeans in 1624 and offers a history of early farming practices. Essays trace the function of place and memory in Asian cuisine, the rise of Jewish food icons, the evolution of food enterprises in Harlem, the relationship between restaurant dining and identity, and the role of peddlers and markets in guiding the ingredients of our meals. They share spice-scented recollections of Brooklyn, Queens, and the Bronx, and colorful vignettes of the avant-garde chefs, entrepreneurs, and patrons who continue to influence the way New Yorkers eat. Touching on everything from religion, nutrition, and agriculture to economics, politics, and psychology, Gastropolis tells a story of immigration, amalgamation, and assimilation. This rich interplay between tradition and change, individual and society, and identity and community could happen only in New York. Annie Hauck-Lawson is president of the Association for the Study of Food and Society, a registered dietitian, associate professor of foods and nutrition at Brooklyn College (ret.) and creator and Master Composter of Brooklyn Mompost. Jonathan Deutsch is associate professor of culinary arts at Kingsborough Community College and of public health at the Graduate Center of the City University of New York. He is the author, with Sarah Billingsley, of Culinary Improvisation.Michael Lomonaco is a restaurateur, chef, cookbook author, television host, teacher, and regular contributor to Gourmet, Food & Wine, Bon Appetit, New York Magazine, the New York Times, and Travel & Leisure.